In 2002 psychologist Daniel Kahneman was awarded the Nobel Memorial Prize in Economics for his study of financial decision making. One specific area of interest is the gap between the returns that are earned in the markets when an investor builds a diversified portfolio which is rebalanced in a timely manner compared to the returns earned by an investor who moves money around in an emotional response to what is happening in the markets. The investors who let their emotions take control and move their money around earn lower returns. Many investors earn lower returns not because of the investments they originally choose, but rather because they make poor decisions. If these investors behaved differently while still using these same investments, they would experience far better results. 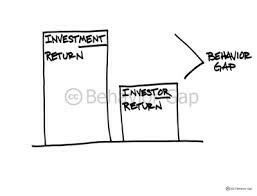 Carl Richards coined the term “behaviour gap” to describe the gap between the higher returns investors could earn and the lower returns they actually earned. At Complete Financial Advice we highly recommend his book, The Behaviour Gap, Simple Ways to Stop Doing Dumb Things with Money. His simple sketches illustrate many of the silly things people do with money. Can working with a Financial Planner Help Avoid the Behaviour Gap? This depends on the quality of the professional you select .In fact there is even a behaviour gap around the understanding of what a financial advisor does. Before you make a select a professional, take the time to understand the difference between Life Planning, Financial Planning and Independent Financial Advice. Complete Financial Advice Ltd was selected as 2014 Best Munster Broker for Life Pensions & Investments by the Irish Brokers Association. Also shortlisted for Best National Broker. Fergus is an Owner and Director since 2003 and he has with over 26 years experience in financial advice & planning. This entry was posted in Cork, Financial Services, Retirement Planning and tagged cork, Financial Planning, Life Planning, professional financial advise, Retirement Planning. Bookmark the permalink.